Receive briefing from McDonald's and help run the welcome table, sundae bar and McDonald's Activities (using a supplied kit). MUST wear a SORA logo shirt of some kind. Help run the welcome table, sundae bar and McDonald's Activities (using a supplied kit). MUST wear a SORA logo shirt of some kind. We need people wearing SORA gear to help run this event. We're looking for 4 adults who can arrive at 4:45 for a briefing and then 6 people who can cover 6:00-8:00. Obviously the more the merrier so even if you don't sign up to cover a shift, we want/need you there to support this event. The way this works is that the flyers you will get via email need to be brought to the counter when the guest places their order. We can distribute these flyers to friends, family and the community prior to the event but we cannot pass them out at McDonald's that night. 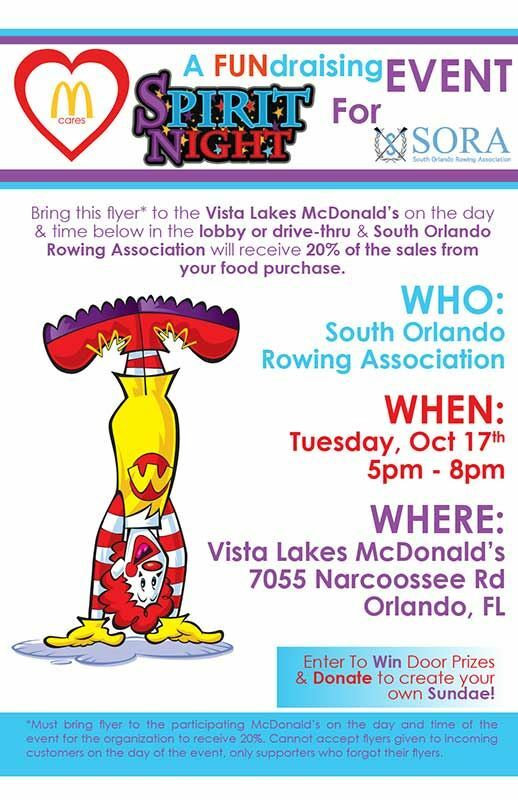 Please join us and help make this a great fundraiser for SORA!